J Olaitan, O Adeleke. Bacteria In Day Care Environment. The Internet Journal of Microbiology. 2006 Volume 3 Number 1. With the need for women to get involved in economic enhancement of the family and with career mothers in the increase in our society, there has been increase in the need to have day care centers to keep the little baby while both parents go to work. Often children come home from some of the Day Care centres with episodes of diarrhea, gastroenteritis and skin diseases. A number of these centers are established in our country without any supervision as to standard of the environment. Five Day-Care centers in the city of Abeokuta were involved in this study. Swabs from the floor, cots of the baby, the toilet and the hands of the nurses involved in their care were collected. The samples were analyzed and tested for total viable bacteria count plating to determine microbial count and types. A total of eleven different bacterial isolates were identified. Almost all the bacteria isolated in this study were enteric which are mostly responsible for enteric diseases in young children. There is a need to improve hygienic behaviours in our Day Care Centres and governments must oversee these centres and ensure the proprietors/proprietresses abide with the minimum standard. Day care Centre is a place where infants and children are kept, for a particular period of time for nursing care, nutrition, sleep, excretion, general comfort and follow up of the children (Wallace HM and Ebrahim, 1981). With the need for women to get involved in economic enhancement of the family and with career mothers in the increase in our society, there has been increase in the need to have these day care centers to keep the little baby while both parents go to work. This has also reduced the age at which these children are taken to these Day care centers for care. The ease of spread of communicable diseases generally depends on the environment, the children themselves and the employees of these Day care centers who take care of these children. Often these children come home with episodes of diarrhea, gastroenteritis, chest and skin diseases. Five of such centers in Abeokuta, the capital city of Ogun state, in south western Nigeria, were involved in this study. The aim was to determine the level of hygiene in these centers. The bacteria isolated as well as the bacteria count were determined. The results are reported in this paper. Five different day care centers within Abeokuta township were involved in this study. The general environment of the Day Care Centres was noticed. Sterile cotton buds were used to collect samples from the floor, cots of the babies, the toilets and the hands of the nurses/assistants involved in their care. Each cotton bud was put inside sterile 10ml normal saline immediately after swabbing to keep the organisms alive from the Centre to the laboratory. Aseptic techniques were observed during collection of the samples. The samples were analyzed and tested for total viable bacteria count, plating to determine microbial number and types. The microorganisms isolated, from the five Day Care Centers differ from one center to the other and were both pathogenic and non-pathogenic organisms. Various bacteria were isolated from all the Day care centres. These isolates were gotten from the floor, toilet, cot and the hands of the nurses. The bacterial isolates were Staphylococcus aureus, Bacillus sp., Klebsiella sp., Pseudomonas aeruginosa., Escherichia coli, Streptococcus faecalis, Proteus sp., Shigella dysenteriae, Enterobacter aerogenes, and Micrococcus. E. coli and S. aureus were common isolates from all the Day Care centers. S. aureus, S. faecalis and E. aerogenes were isolated from two centres while S. dysentariae was isolated only from one centre. Other organisms observed were Proteus sp., Pseudomonas aeruginosa, Escherichia coli, Streptococcus faecalis were some of the organisms isolated. Most of these organisms were enteric bacteria, which possibly found their way through chance contamination from lack of good personal and public hygiene suggesting faecal contamination. While Staphylococcus aureus was the most predominant isolate having the highest percentage of compared to other bacteria isolated, Micrococcus sp. had the lowest percentage of all and was isolated from day care centre IV only. In summary, it was noticed that all the samples collected from each day care centres showed significant growth of bacteria. The implication of this on the children kept in these Day care centres can only be imagined. Day care Centre is a place where infants and children are kept for a particular period1. It is also defined as a valuable component of the services for preschool children. Day care Centre has also been described as a place which is directed to a group of children or infants and given by a nurse who is accountable for such care on 24 hours basis or less until the children leave the place3. In Day care centers the nurses take responsibility in nursing care, nutrition, sleep, excretion, general comfort, plans for discharge and follow up of the children2. Day care center means supplying the provision, attention and support to meet the physical, mental, and social needs of the growing child4. The children group comprises about 45% of the population in developing countries and the infection rate is highest in the 0-5years of age5. Infants and young children are more prone to infectious diseases and are more amenable to immediate care because some of the diseases suffered are environmental in origin and can be contained and prevented by an intelligent nurse who has acquired the relevant basic hygiene skill6. Infections are major health problem in this (0-5years) age group including the common communicable diseases of childhood. Children in the Day care centers are exposed to infection due to the physical environment of the place3. Dirty environment may harbour infectious agent and predispose to skin infections. A good Day care is however able to keep its environment in good working order, free from all preventable epidemics. The care of the infants require greater skill and attention both because the child is small and “slippery” and also because he is easily infected by microorganisms in contact with7. Microorganisms are very ubiquitous8. They are present on the floor, body, air, toilet e.t.c. 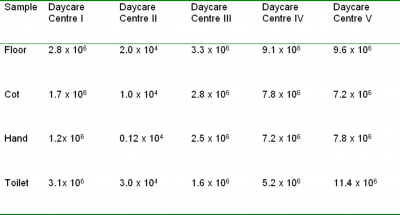 In the current study, the types and number of microorganism found in the Day care centers differ from one another. Edward9 has reported that Day care centers have been implicated as settings for the spread of communicable diseases, especially diarrhoea, among young, susceptible children (1-5years) due to poor hygiene with the staff of the Day care Centre. Almost all the bacteria isolated in this study were enteric which are mostly responsible for enteric diseases in young children. Of the many species of pseudomonas, the species most frequently encountered in human clinical specimen is Pseudomonas aeruginosa and has been isolated from soil, beside water container, hand, creams, skins etc10. Although E. coli is part of the normal flora of the intestinal tracts, certain strains can cause a moderate to severe gastroenteritis in humans and children. Enteric pathogenic strain colonize the jejunum and upper ileum of the small intestine and cause acute gastroenteritis in newborns and in infants up to 2 years of age. Enteroinvasive strains invade the epithelial cells of the large intestine and cause diarrhoea in older children and adults. Staphylococcus aureus was very common in each of the day care centre as a pathogenic organism. Infections from this organism occur when staphylococci enter the body through breaks, cuts, and abrasions in the skin or mucous membranes. Staphylococcus aureus causes localized infections in which the characteristic lesion is a walled – off “fort”. The abscess cavity fills with pus cells, dead tissue and bacteria10. Streptococcus faecalis was isolated and identified from day care centre I and V from the hand of their nurses. This is most probably through poor hygiene especially non- washing habit after using the toilet or non-thorough washing of hands with soap and water after attending to a child. Shigella dysenteriae which causes dysentery in infants and children was isolated from day care centre I. This infection has been observed to pass from the faeces of an infected person during defaecation to their hands and finger nails11. Infection then passes to another person either directly or indirectly by physical touch or indirect by contaminated food. Outbreaks are common under conditions of overcrowding where hygiene practices are poor such as day care centres. It has been observed that gastrointestinal diseases continue to be a major health problem in primary schools in the United Kingdom due to surface contamination of carpets12. This report is in line with the highest percentage of isolates from day care centre IV much contamination of the floor with microorganisms. The conclusion of Alvarez et al.,1994 showed that the high rate of diarrhoea illness in the childcare setting include attendance of non- toilet trained children13. Habit of hand washing program suggested to prevent at least some of the diarrhoea in day care centres has been suggested14 and it has been suggested that in controlling the occurrence of diarrhea among children, sanitation facilities seemed to be more important than the supply of drinking water15. The toilet of these young children should be maintained very well by washing with disinfectants to reduce the number of pathogenic microorganisms. With increasing numbers of women in the workforce, day care centres have been increasing in number and the children at this age are at a higher risk of gastroenteritis diseases caused by a large number of enteric pathogens and the risk is increased by the greater potential from person to person transmission within the group care. Of all the five different day care centres sampled none was free from microorganism. This study revealed that enteric organisms were present in day care centres studied and these were probably spread by the hands of the children and employees. Hand washing has been recommended as a preventive measure. Faeces should be disposed off in a sanitary manner. Use of sufficient toilet paper should be stressed to reduce hands and fingers from coming into contact with faeces in these centres. Flies should be controlled by screening with nets, by spraying with insecticides, and by the use of insecticide baits and traps. Fly breeding should be controlled by the frequent collection and disposal of garbage. Scrupulous cleanliness should be used in handling and preparing food. There should be strict hygiene about the hand washing enforced in setting such as day care centres, the Texas Department of Health (TDH) warns, “one child's infection can spread throughout a group to become a persistent problem”. Day care personnel must always be at alert to signs of the common infections, and should be aware that if one child has diarrhea, the probability is high that others also may be exposed, they have to separate the infected children from the rest children to avoid or reduce the rate of spreading of the infection. Surveillance of the buildings and indeed the environment of Day care centres must be regular and routine. This will allow for proper monitoring of these centres and reduce the chance of children coming from Day care centres with infections. 1. Wallace HM and Ebrahim GJ. Maternal and child Health around the world. The Macmillan Press Ltd. London 1981, 241-243. 2. Behar MA. Nutrition and the future of the mankind, WHO Chronicle, WHO, Geneva125-143. 3. Henderson P Report on preschool health. WHO/SEA/MCH/72. Seminar proceeding. 20-23. 4. Hew RA. Project for intensive infant care. DHEW publication NO HAS Rockville, Maryland 74-90. 5. Gamblin R. Modern preschool hygiene. Journal of Environmental Sciences. 1996; 25(30) 2004-2006. 7. Beneson E and Abram S. Control of infectious diseases in children. American Public health Association 1995; 88-94. 8. Popoola D. Essential of Microbiology. ( Jedidah publishers, Abeokuta) 13-24. 9. Edward CE. Public Health , Food and Industrial Microbiology. Ambik Press Publishers, Benin city. Revised edition; 57-59. 10. Pelczar, M.J. (1999). Microbiology 5th edition, MCGrew- Hill Inc. university of Washington, USA pp 300. 11. Prescott, L.M., Harley, J.P. and Kleon, D.A (1999) Microbiology 4th edition, McGraw Hill publishing company, New York pp. 602. 12. Kaltenthaler, A.J., Ponka, A. and Meurman, J. (1995). Gastrointestinal Microbial Ecology. Journal of Science and Medicine 5:200-212. 13. Alvarez, K.C., McCartney, A. L. and Gibson, G.R. (1994). Intestinal microflora of human infant and current trend for its nutritional modulation. Journal of Nutrition. 87(5):405-420. 14. Black, D.J. (1980). Environmental Health. Elsevier Science Publishers, London, 5th edition, pp.98-134. 15. Arif, G.M and Ebrahim, S. (1995). Diarrhoea morbidity Differentials among children in Pakistan. Pakistan Institute of Development Economics, Islamabad. pp 205 - 230.